In a few days, Venezuelan voters will head to the polls for the second time  in six months. They’ll be choosing a successor to former president Hugo Chavez, who died  in March. The country’s political climate is no less chaotic than it was during the election  in October, however a group of NGOs have been able to come together to work towards transparency in the electoral process. our goal is to place at the service of the population as many forms of contact as possible so they can make their complaints using the mechanism that suits them best, both during the campaign that begins tomorrow and the day of the elections. Are the efforts to reach more Venezuelans with the simple message that they can both access and add to information about electoral malfeasance working? One coalition member, Usted Abusó, has received over 200 reports in 2013 which are largely about the political use of state resources. 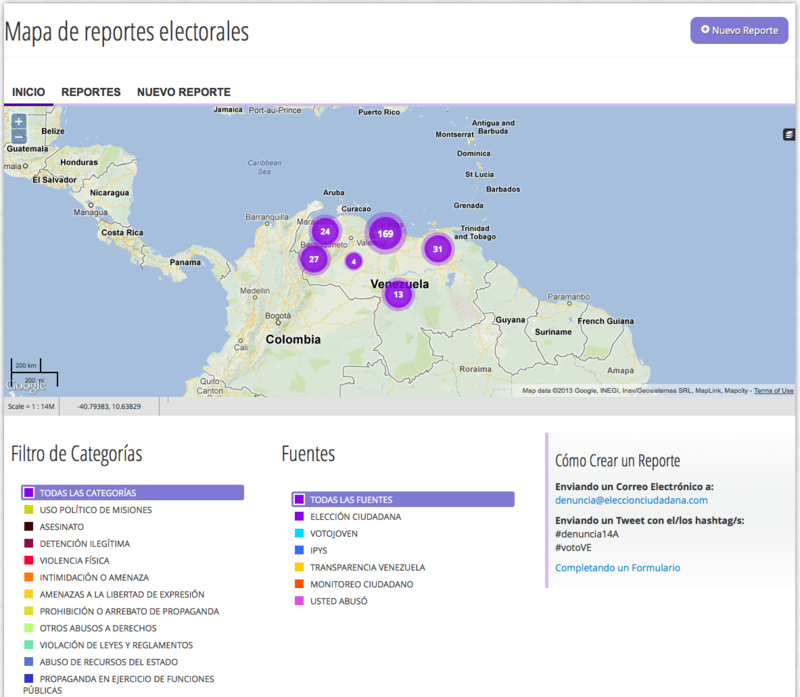 Nearly 200 reports have been channeled thus far to Elección Ciudadana, which provides a map  [es] that pulls in citizen reports that were originally sent to collaborating organizations. Its team expects to receive significantly more this weekend, when violence, detentions and failures in the election systems are all likely. Indeed, political violence has already begun – for instance there was politically motivated murder  [es] and assault  [es] this week. On election day, Elección Ciudadana will be maintaining a volunteer center – organized largely by Venezuela Inteligente  [es] – for individuals to intake, verify and post reports. Many others will be volunteering from home. Their hope is that the varied networks and experiences of each coalition member will make it easier to process, integrate and respond to reports on election day; they will be trying to elicit responses both from major media outlets and the official election authority [es].